This image taken by NASA's Curiosity shows what lies ahead for the rover -- its main science target, Mount Sharp. 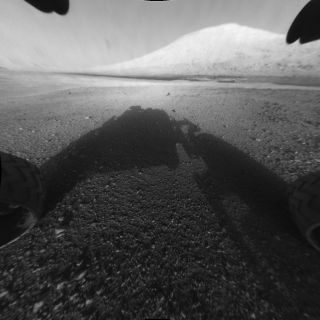 The rover's shadow can be seen in the foreground, and the dark bands beyond are dunes. NASA's Curiosity Mars rover has snapped some stunning photos during its first two full days on the Red Planet, and things should get even better on day three. Curiosity landed inside Mars' huge Gale Crater on Sunday night (Aug. 5) and almost immediately began beaming black-and-white images back to Earth. But now, during its third full Martian day — or Sol 3, in mission lingo — the 1-ton robot should start snapping some truly jaw-dropping views, researchers said. The pictures will be taken by MastCam, a set of two camera systems on Curiosity's head-like mast, which was deployed on Sol 2. "We're going to do the MastCam 360 full-color panorama," Curiosity mission manager Jennifer Trosper, of NASA's Jet Propulsion Laboratory in Pasadena, Calif., told reporters Wednesday (Aug. 8). "There are going to be some amazing images from that." The Curiosity team also plans to send a major software update to Curiosity on Sol 3, Trosper said. The rover will transition to the new software from Sol 5 to Sol 9. Curiosity's days on Mars aren't synched up with its handlers' days here on Earth, so the mission team is facing a transition of its own. Sol 3, for example, began at about 8:45 p.m. PDT (11:45 p.m. EDT) Wednesday, Aug. 8, which is 0345 GMT on Aug. 9. Curiosity is the centerpiece of NASA's $2.5 billion Mars Science Laboratory mission, or MSL. The rover's two-year prime mission seeks to determine if the Gale Crater area is, or ever was, capable of supporting microbial life. To get at this question, Curiosity will analyze Red Planet rocks and soil with 10 different science instruments. The rover team has just begun the months-long process of checking out these instruments and vetting Curiosity's overall health. So far, everything looks good. The six-wheeled robot's communications and power systems are working perfectly, Trosper said, and no serious issues have been found with any of the cameras or instruments that have been turned on to this point. "With the spacecraft being as healthy as it is and the capability that it has, all our options are open for science," said Curiosity chief scientist John Grotzinger, a geologist at Caltech in Pasadena. Visit SPACE.com for complete coverage of NASA's Mars rover Curiosity. Follow SPACE.com senior writer Mike Wall on Twitter @michaeldwall or SPACE.com @Spacedotcom. We're also on Facebook and Google+.